One thing you must know when travelling to the Maldives: Most flights arrive late at night ( 9PM onwards) , and it is customary for most travellers to book themselves for 1 night in Male (the capital of Maldives), and catch their respective transfers to the resorts early the next day. Male Airport (Ibrahim Nasir International Airport), is located in Hulhule Island. Most accommodations are in Male City itself, where you need to take a ferry from the airport, then back to the airport again to catch your seaplane or speedboat transfer. A lot of travellers reason that “it’s just for one night”, and they are willing to take the city hotels (most also have small rooms as they are aware of the main purpose of tourists overnighting in Male). However looking into most reviews of hotels/inns in Male City and the quick reviews are not that favourable, always noting that the property “is ok for just a one night’s stay”. 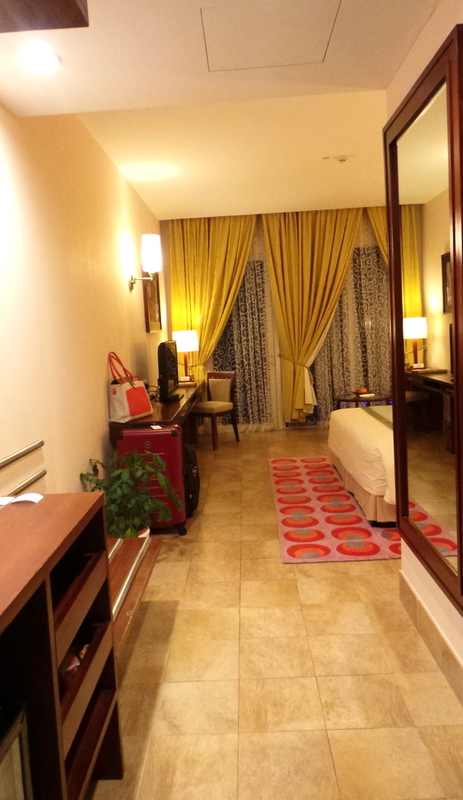 There is one known hotel brand in Male but it’s not the most reasonably priced for a night’s stay. 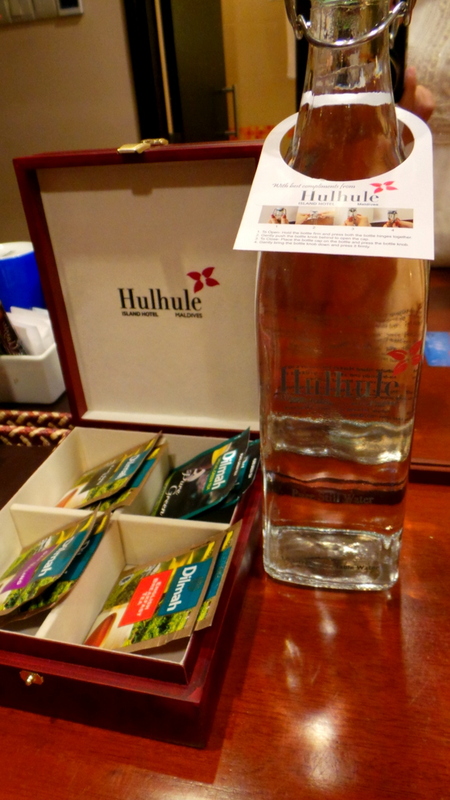 When I was doing my research on which hotel to stay at for the night in Male, I found Hulhule Island Hotel. It seemed to fit what I was looking for. It was very close to the airport, (located in the same island) and was almost like a resort itself. 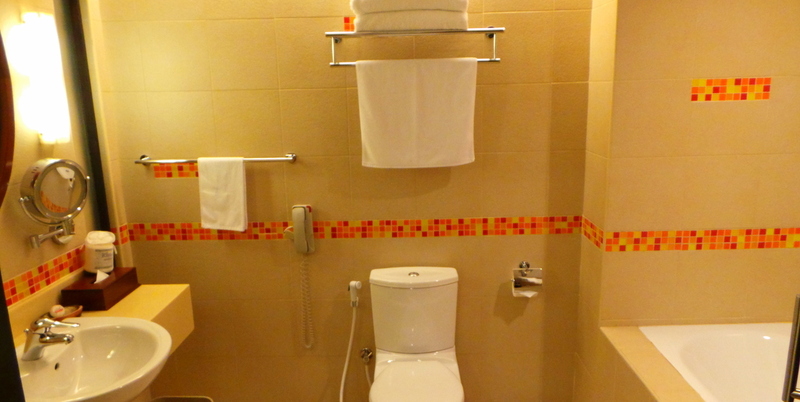 For most, the 1 night’s stay in Male is not something to get excited about : they see it as a necessity to be done. 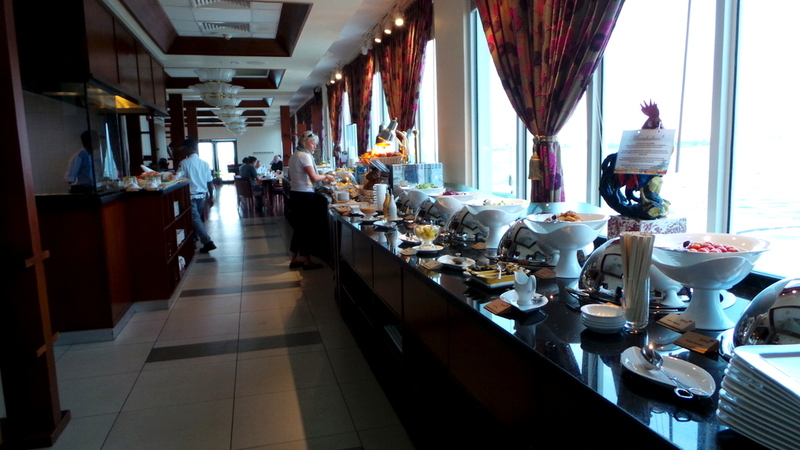 But for this particular stay, I was quite looking forward to discovering Hulhule Island Hotel even for a short period, and this is how our stay panned out. We had been travelling for almost 24 hours from Sydney to Male (with a 6 hour stop over in Kuala Lumpur). We arrived in Male almost 10 PM and although we were excited, we were definitely in need of a good snooze! It was a relief to see a Hulhule Island Hotel representative holding a sign with our name right as we exited the Airport door. Our bags were taken and we were ushered to the hotel van. No waiting was required, we moved to the hotel right away. The ride took less than 5 minutes! Despite the late arrival at the hotel (at this stage it was about 10:30PM) the hotel was bustling. 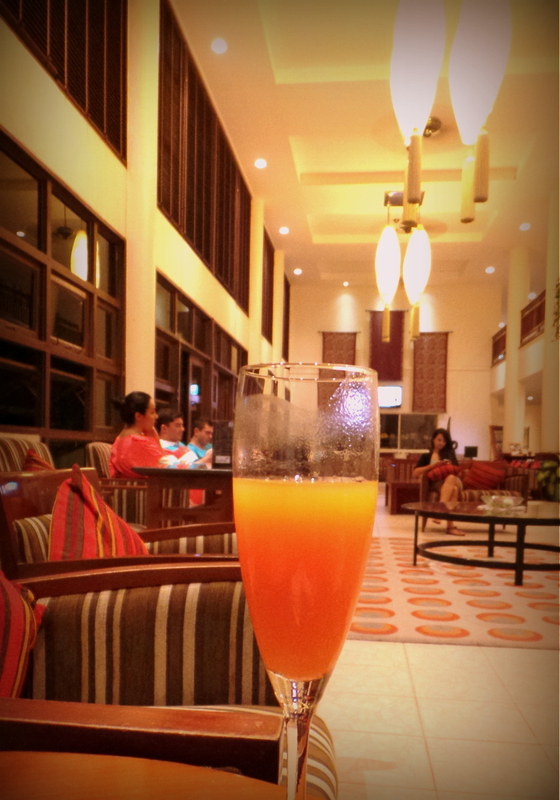 We were welcomed by staff and were immediately given welcome drinks as we were checked in. This was such a great welcome into our first balmy Maldivian night. 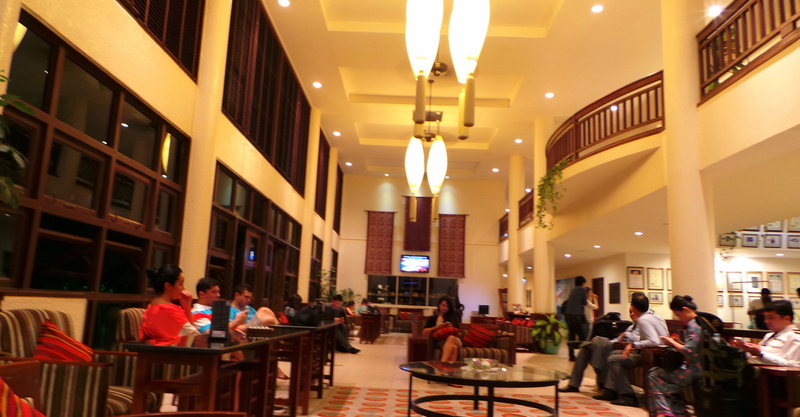 The lobby/reception area had tall ceilings, an open plan and very spacious. If you look to the right, you can see that the Malaysia Airlines crew also use this as their layover hotel. The next day in the morning, I also saw another airline’s crew come to check in. It’s really the perfect choice as the hotel really is thisclose to the airport. We stayed in a Deluxe Ocean View Room. It’s pretty spacious, and though we carried very compact luggages, I can imagine that this would still be roomy even for those who carry huge luggages. Don’t let the close proximity of the airport faze you- we slept soundly through the night. I didn’t hear any roaring jet engines at all. We arrived late at night and though it was dark when I opened the balcony, I can hear the all to0-familiar and soothing sound of waves lapping. And while I’m glad I was able to see Male from afar, I was also relieved I was staying in an island that was not too crowded. Huge double doors open up to a bathroom with a pretty impressive size. There is a makeup mirror and a hair dryer. 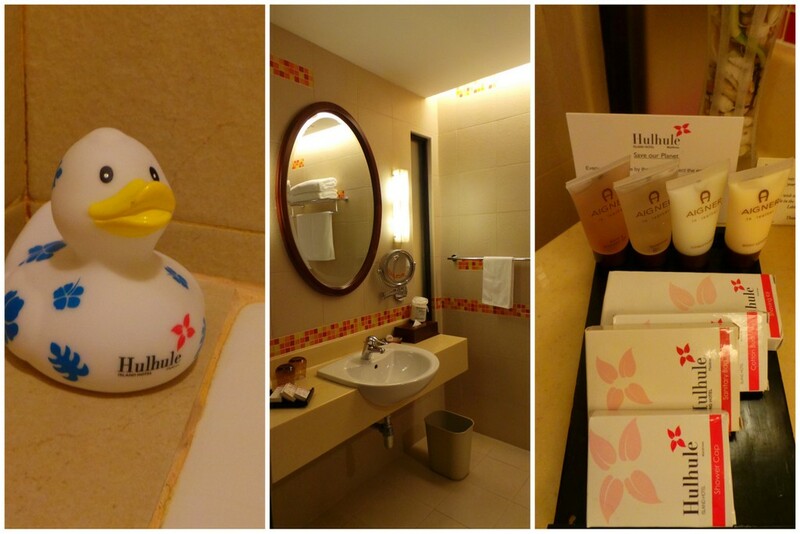 Toiletries are homebrand, and there is a rubber duckie touch to the tub, which doubles as the shower area. 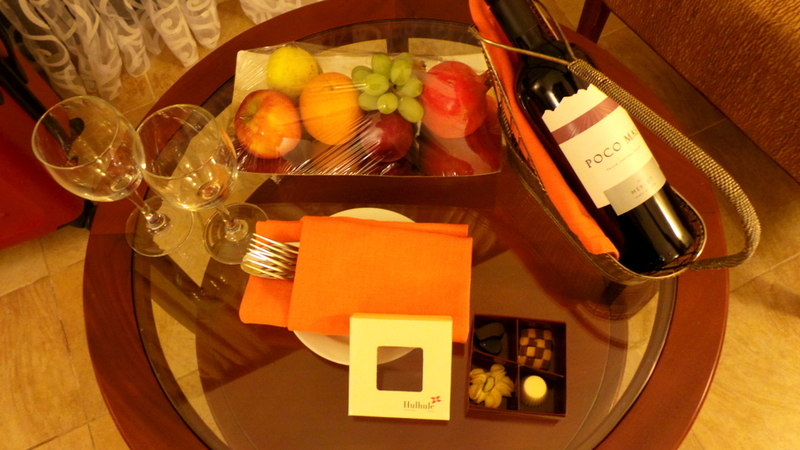 Waiting for us in the room was a bottle of wine, fruits, and a box of chocolates and biscuits, which I nibbled on as a midnight snack. I also appreciate the complimentary water. This should be a standard in all hotels. Coffee and tea making facilities are there. There is a fridge that has a very generous selection of chocolates, juice, milk, and other drinks. Just outside Uduvilaa Restaurant is a lookout and lounge area. 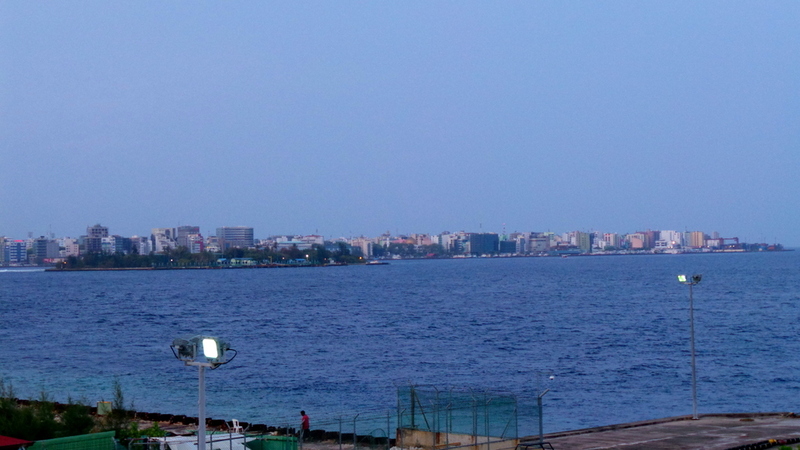 From this viewpoint, you can easily see Male City (behind me), and to the left is the jetty and airport. 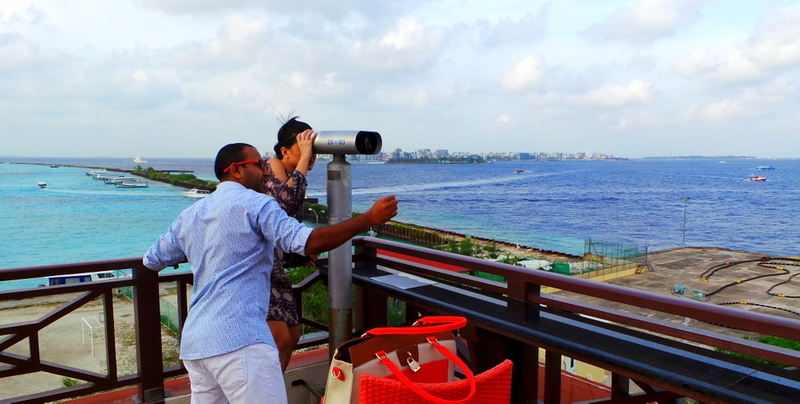 From here, there is also a telescope where you can see the nearest hotels and islands surrounding Male/ Hulhule. From this viewpoint, I was able to see Kurumba Resort, which is Maldives’ first ever resort (opened in 1972). The grounds of Hulhule Island hotel are also sprawling. 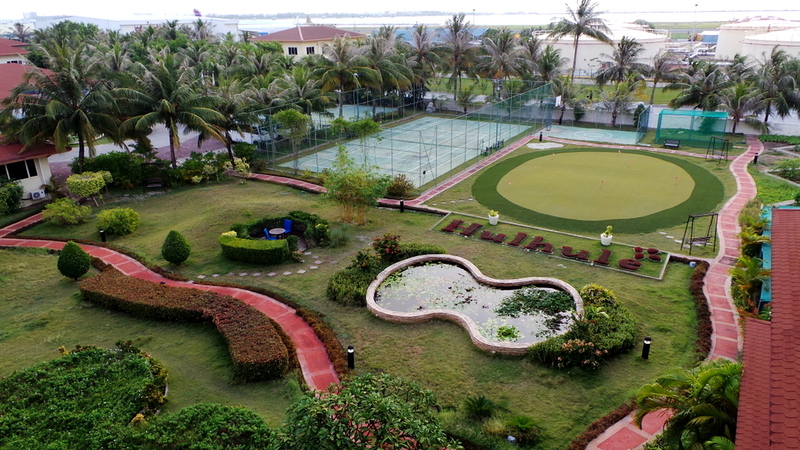 It’s very green, and even has a tennis court, beach volleyball ground, and golf putting area. Hulhule Island Hotel really does stand up to its name as being the nearest hotel to Male Airport, and also (I suspect), the most luxurious. 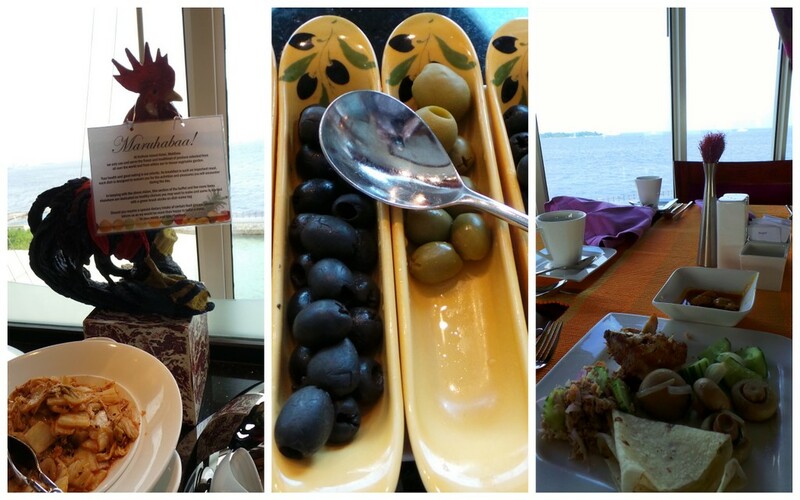 Staying here is a good precursor to the start of an amazing Maldives trip. If this was a meal, it’s an amazing entree to the wonderful mains. An important thing to bear in mind too: just as most flights to Male arrive at night, those same flights also leave late at night. 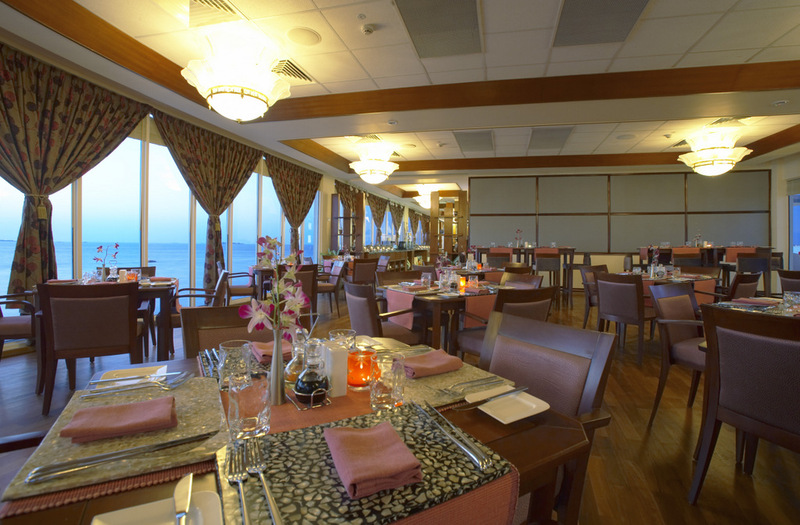 And unless you are willing to pay an extra day or half-day’s rate on your resort, Hulhule Island Hotel is a good place to stay at before leaving the country. 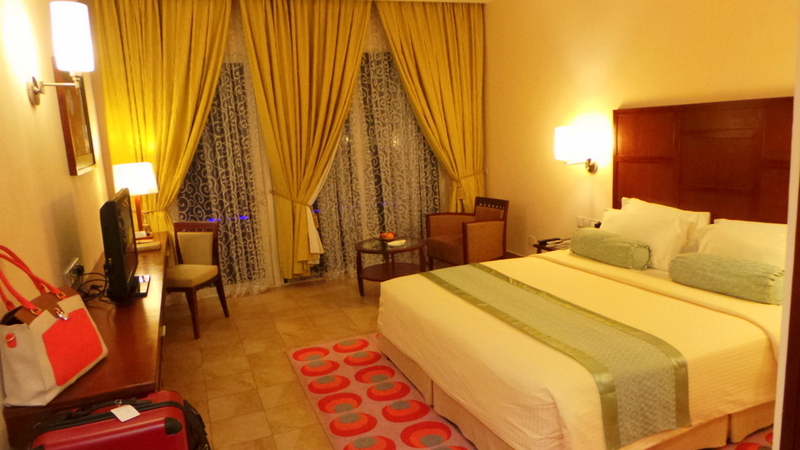 The hotel also offers, free of charge, a day trip to Male City including pick up and drop offs. While we unfortunately didn’t have the time to do this before or after our trip, I would recommend this to anyone with the spare time in Male. Talk about a productive way to spend waiting for your flight! 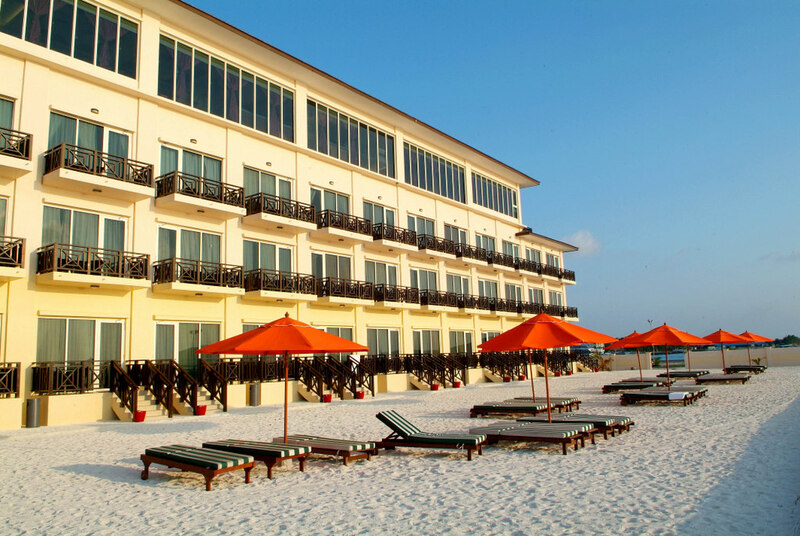 And if you would rather stay at the hotel, Hulhule Island Hotel also offers watersports as they have their own beach. 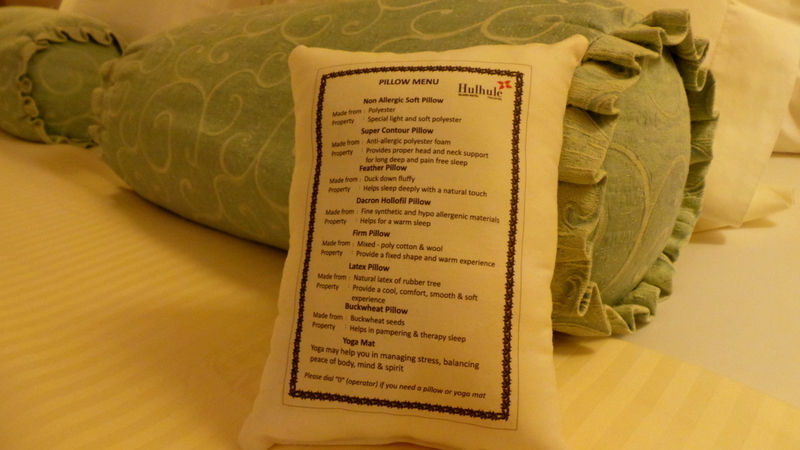 I would recommend Hulhule Island Hotel to anyone needing to stay in Male. Especially if you need a hotel for the night, this is the most logical choice not just by proximity, but by the relaxing and quality factor too. I think one shouldn’t be stressed before and after a long-awaited Maldives trip. 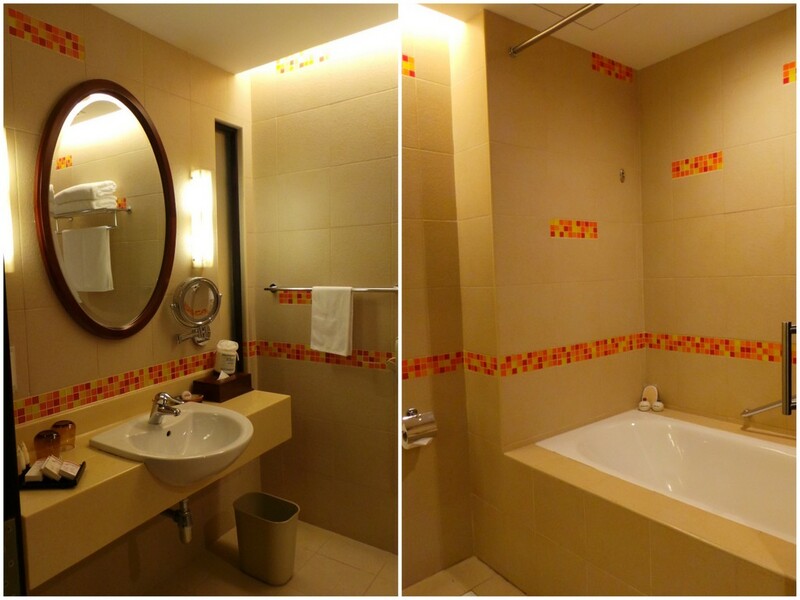 After all, you deserve to be pampered from the beginning up to the very end of your trip.